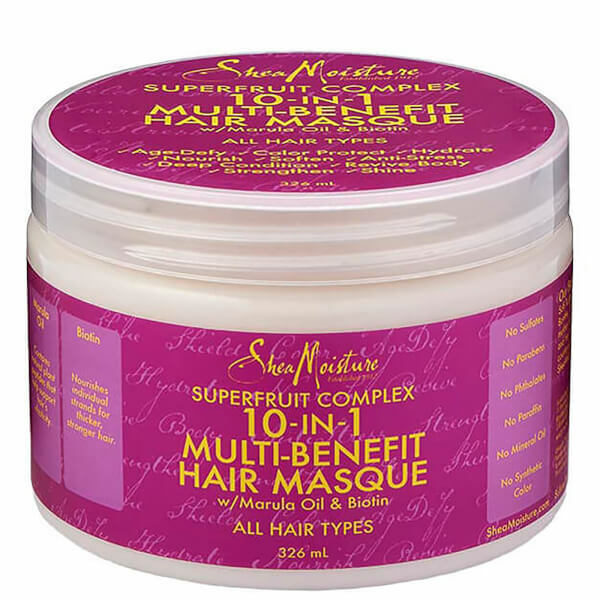 Transform dull, brittle hair with the Superfruit Complex 10 in 1 Renewal System Hair Masque from Shea Moisture; a brand who utilise natural and certified organic ingredients gathered from around the world. Suitable for weekly use, the nourishing treatment blends Marula Oil and Biotin to restore healthy-looking, hydrated strands from root to tip, whilst an antioxidant-rich Superfruit Complex replenishes the scalp and counteracts signs of ageing. Hair is moisturised, conditioned and strengthened. Age-defy, colour protect, hydrate, nourish, soften, anti-stress, shine, revive body, strengthen, deep condition.